It's the "last building" many times over, including being one of the last buildings you would ever think was notable. It was the last work in the North Bay of a great architect, and likely one of his last completed designs. It is the last remaining grand lodge hall in Santa Rosa, a survivor from a time when anyone downtown was only a few steps away from the imposing home of Elks or Eagles or other. It is the last building tied to Santa Rosa's culture during the early Twentieth Century, when most everyone flocked to weekend dances and big parties. It is still there at 404 Mendocino Avenue, and its doors opened on February 25, 1909. William H. Willcox was an esteemed architect (introduced here) who created quite a storm in the months before the 1906 earthquake. He presented a vision where Santa Rosa might leapfrog San Jose and other up-and-coming Bay Area communities and become a showcase for modern urban development. Santa Rosa Creek was to be transformed into a waterfront park that would be the centerpiece of an expanded downtown that included a convention auditorium large enough to host statewide and even national events. Investors lined up and he was only weeks (days?) away from having enough funding to break ground for the big pavilion when the quake struck. Money immediately dried up as the bankers and speculators concentrated on rebuilding their downtown holdings. The earthquake and fires not only took 77 lives, but also killed off Santa Rosa's brightest possible future. He served as Santa Rosa's building inspector immediately after the quake, a time when a dozen or so architects in San Francisco and Berkeley were winning contracts to design the town's new hotels and office buildings. As far is known, Willcox received none of this work (although one building appeared to rip off his convention hall design). It's possible he had jobs in San Francisco, or was too busy because so much on-site supervision was required of him to enlarge and modernize Hood Mansion at Los Guilicos, which was completed in 1908. Willcox appeared destined to leave no legacy in Santa Rosa at all, so it was surprising to find in the 1909 newspapers that one of his pre-quake designs was actually built and about to open. 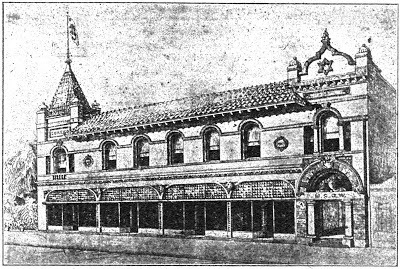 The building was the lodge hall for the Native Sons of the Golden West (NSGW, to its friends). Construction of the building apparently began in late 1907, per the medallion on the wall. It could have started much sooner, had the fraternal society not welcomed Santa Rosa to use their vacant lot as the temporary site of a shantytown for city hall and the rest of the civic center in the sixteen months after the quake. During this time gap Willcox modified the design of the building in several ways, and we're lucky to have a copy of his original drawing as well as his revision. All versions of the front face - including what was actually built - were equal parts California Mission Revival Style and Romanesque. With its overhanging tile eaves and Spanish-baroque parapet, the roofline was strongly Mission, particularly when there still was a north tower to showcase more tile. Everything below that is Romanesque, but not busy; even today, the archtop ribbon windows against the smooth stucco wall looks clean and modern-ish. Few architects could blend these very different styles so successfully. "Masterpiece" might be going too far, but it's truly damned impressive. The roof design evolved the most. Originally Willcox plopped a cupola on the north end to be the base for a flagpole. He did much the same in his convention center design, and those two 1906 drawings even show U.S. and state flags fluttering in the same way over the buildings. In the later NSGW drawing, the cupola became a steep pinnacle over columns suggesting a tower with turrets. The California motto, "EUREKA", was now in framed relief as part of the wall. In the finished version, the pinnacle became squat and more conventional while the turrets became taller and heavier. If you isolated the profile of the northwest corner as shown in the 1935 postcard, it could be the bell tower of a nice Methodist church. Today the north tower is completely gone and as a result, you can't look at the building from the other side of the street without thinking how strangely lopsided it seems. On the south end of the roof, design changes were less dramatic. The parapet was simplified and lost its flagpole. Instead, there was a "brilliant electric star that burned on top of the turret outside," according to the description below. Solomon's Seal (not a Star of David; the NSGW wasn't a Jewish group) remained unchanged through all the versions. On the second floor, the Palladian windows at either end of the building became single windows framed by engaged columns, which nicely complimented the entranceway. With its large upstairs ballroom and banquet facilities, the hall was an immediate hit with the social set, accommodating parties too large - and maybe, too boisterous - for the Saturday Afternoon Clubhouse, which was about Santa Rosa's only other venue for rent. If you danced before 1940, you danced here. Hardly a week went by in following decades without the papers announcing one or two doings down at Native Sons' hall, and according to "Santa Rosa's Architectural Heritage," the Native Sons of the Golden West only sold the place after it was declared unsafe to continue hosting large gatherings. Sadly, the only interior view we have shows just the lodge room (besides the large image below, the Sonoma County Library supposedly has a partial view taken from another angle, but the details don't match). While Willcox went through multiple revisions of the exterior until he elegantly simplified the design, this photo shows a Beaux-Arts mess. Under a breathtaking stained glass skylight were walls smothered with fussy ornament, from swags to thick entablature to oversized corbels to ribbon molding over arches interrupted with band molding. There was an architrave in the arch behind the dais, although that's the sort of detail you normally only find above the doorway of cathedrals. In sum: It looked like a wedding cake where the baker kept larding on more layers of mascarpone decorations just to jack up the bill. Except for the skylight, maybe it's not such a tragedy that the interior has been since remodeled to death and apparently retains no original details (some interior views are available via the leasing agent). Even while Willcox was collecting Santa Rosa's praise, he wasn't collecting money from the City Council that he thought was his due. His lawyer threatened suit over $1,630: $1,000 for plans drawn up before the earthquake for the E street bridge, and $630 for a firehouse design. Whether he was paid or even had a legitimate case is unknown, but Empire Building architect John Galen Howard had also submitted plans for a new fire station, so Willcox probably had cause to believe the city was soliciting designs (the City Council decided to go on the cheap and just build a replica of the old 19th century building). As for the bridge, Willcox had already demanded $300 for the blueprints in 1907, which is probably why the Press Democrat dryly noted, "Mr. Willcox's claims have been heard from before." Willcox probably didn't work again in the North Bay (although he died twenty years later at the Veteran's Home in Yountville), but the PD had another little item about him in 1909, noting that he had a commission to design the Elks Hall/office building in Stockton. That turned out to be a nice but undistinguished design in a restrained Beaux Arts style (picture here). He stayed active as an architect through at least part of the 1910s, but it's unknown if he actually built anything after Stockton. If not, the Native Sons' hall in Santa Rosa will stand as his last great work. One of the finest structures to be built in Santa Rosa this year is the handsome Native Sons' Hall which is to occupy a conspicuous lot within half a block of the Courthouse, on Mendocino street adjoining the Riley property. It will be a building worthy of the advancement and progress of the City of Roses and one that will be redound with credit to Santa Rosa Parlor of Native of Sons of the Golden West [sic], whose home it will be, and an attractive ornament to the city. As stated in this paper the plans for the building were finally adopted at a meeting of the directors of the Santa Rosa Native Sons' Hall Association incorporated, and the accepted design is reproduced in the picture above. Judge Emmet Seawell is the president of the Board of Directors of the Hall Association. The plans were accepted after very careful consideration, the object being to have a structure that would meet all requirements. Santa Rosa Parlor has a large and growing membership and the securing of such a commodious and comfortable home, with the additional attraction of the social features that the possession of clubrooms will afford is sure to prove advantageous in an increase of membership. While the social and fraternal sides were considered it was also deemed advisable to see that the building should be made a good financial [illegible microfilm] has been given that it will be so. The plans adopted call for a two story building, modified Mission style, with handsome entrance and wide stairway to the upper floor. The lower floor will be divided into four stores, 20 feet wide in the clear, with modern plate glass fronts and marble base. The upper floor will include the largest and handsomest lodge room in the city, commodious ante-rooms, handsome club rooms, large banquet hall, with kitchen, pantries, and all necessary conveniences. There will be a stage in the banquet room and a fine floor in the hall for dancing. The estimated cost of the building with the furnishings is $30,000. The plans accepted were those prepared by Architect William H. Willcox of this city. Santa Rosa Parlor of the Native Sons of the Golden West took formal possession of their fine hall and clubrooms on Thursday night, and right proud are the members over the completion and acquisition of their handsome new home. They have a right to be. The City of Roses is also particularly pleased over the addition of such a noble structure to her newer and greater self. Thursday night's installation of the new officers of the Parlor in the new hall was the first regular meeting, for the previous meeting of the parlor held there, was a special one. There was a large gathering of the members present, and they entered heartily into the occasion and its attendant significance. The brilliant electric star that burned on top of the turret outside furnished a suggestion of the welcome inside, and the idea was admired by many who looked up at the lights and were informed of the importance of the gathering within. Inside and outside the Native Sons' building presents an attractive appearance. Many citizens have been privileged with an inspection of the building, and have come away expressing their admiration for it. The entrance, with its marble finish, broad stairs and clusters of lights, is very imposing, and a fitting introduction to the fine equipment of the building. The reception hall at the top of the stairs is very neat and right here it can be truthfully said that Architect William H. Willcox planned very cleverly in the arrangement of the building throughout, and is certainly entitled to congratulations. He is personally proud of the successful completion of his plans. From the hall entrance is gained to the main lodge room, the clubrooms and the dance hall. The lodge room is a beauty. It presents a very attractive picture, particularly with the arch and and dome effects that have been carried out in its construction. The lighting, by stained glass skylight by day, and by a myriad of electric globes by night, is most effective. The lodge room furnishing is also very tasteful. The mahogany furniture and chairs upholstered in Spanish leather. and the fine Brussels carpet on the floor add a finish that is very pleasing. Mention has already been made of the dance hall. This will be a thing of beauty and a joy to devotees of the fascinating pastime for years to come. When all is completed and the bevelled mirrors adorn the walls and other artistic furnishings are seen in all their radiance there is no doubt of the popularity of the place for dances and parties. The orchestra will be stationed in the northeast corner of the room. The same style of elegance that is noted in the other rooms applies to the clubrooms. There is a home-like appearance at once gives the rooms by the large fireplace and its African marble finish. In these rooms there will be billiard tables and other accessories for the pleasure of the members. The possession of this notable home should be the means of bringing into the fold of Santa Rosa Parlor all the available membership. The banquet room must not be lost sight of, either. It is in the third story, and when fully equipped will be as nice a place for its purpose as could be found anywhere. Then there are the dressing rooms and the other offices, all complete in their details, and designed with the idea of comfort and convenience uppermost. There is no doubt but that Santa Rosa has one of the finest homes the order has in the Golden West, and there are very few fraternal buildings of the kind to be found anywhere in the state that excell [sic] it. Attorney G. W. Barlett of San Francisco sent a letter stating that W. H. Willcox, the architect, had referred to him his claim for $630 for plans which Willcox says he once furnished to the city for a fire department station, and $1,000 for plans for the E street bridge. The letter was referred to City Attorney Allison B. Ware for consideration. Mr. Willcox's claims have been heard from before. Bartlett threatened a suit. 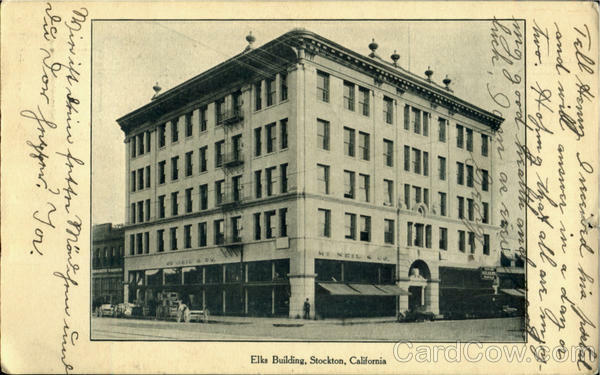 The plans for the new $100,000 Elks hall and building in the city of Stockton prepared by William H. Willcox, the well known architect of this city, have been accepted and naturally Mr. Willcox and his friends here are very much pleased at the recognition given. Mr. Willcox has a fine record as an architect and has designed many large and important buildings in this and other states. The building in Stockton is to be a magnificent structure and will be modern and unique in many respects. Mr. Willcox's friends among the members of Santa Rosa Elks lodge are very much pleased over the fact that his plans have been accepted. Mr. Willcox is one of the "baby Elks" of Santa Rosa lodge, that is he was one of the last of the new members to be initiated.